As far as local multiplayer games go, Towerfall is one of the premier experiences of the last two years. Succeeding from it’s roots on the Ouya, Towerfall Ascension has came a long way for a game derived from such a small team. The first expansion, Towerfall Dark World, adds a multitude of archers, arrows, levels, difficulty, variants, as well as a new co-op campaign mode. But does Dark World offer enough to warrant a double dip into Towerfall? Right off the bat, Dark World introduces a brand new archer as well as alternate designs for each existing character. All of whom carry the familiar charm you’d come to expect and essentially double the games roster. There are two new arrow types: the Prism Arrow that encapsulates archers attempting to intercept it, and the Trigger Arrow that works like a remote mine for strategic use in destructible environments. Of the two, the Trigger Arrow seems infinitely more useful, but both serve a unique purpose and help mix up larger scale battles. 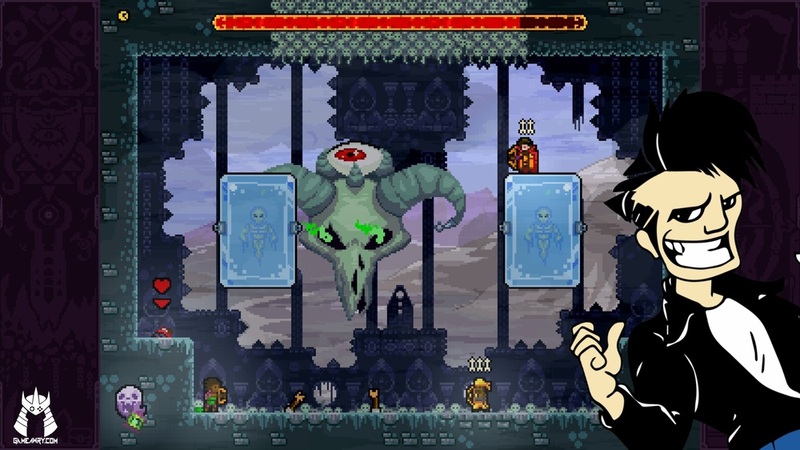 Dark World ’s real meat comes from it’s new four stage and four player co-op campaign mode. Previous versions of the co-op campaign only allowed for two archers at a time, which now seems like a pretty big oversight. Dark World Mode is some of the most fun I’ve had playing Towerfall thus far. Switching up the formula by offering powers and curses as well as a new difficulty and a layer of procedural stages are nice, but might mean very little to casual players. Even so, players old and new should find plenty of enjoyment with the new revival system and a few fresh boss fights added to the mix. The improvements are nice, and help keep all four players involved with the game for when you crank the difficulty up to legendary. Four player co-op campaign seems like a no brainer after playing Dark World. Strangely enough, my favorite part of Towerfall Dark World was actually the soundtrack. The new levels are spruced up with some of my favorite tracks in the game. It might seem like an odd thing to mention, but I found it noteworthy enough to purchase the accompanying soundtrack. Dark World's tunes are the rhythm of the night. All-in-all, Towerfall Dark World is a solid addition to one of my favorite local multiplayer experiences since Super Mario 3’s Battle Mode. Dark World, much like the original, caters to the multiplayer audience heavily, so I recommend it highly for anyone who’s a fan of friendly in-house competition or arcade style couch co-op. Dark World is a tasty spoonful of flavor atop an already well thought recipe. For giving me another excuse to hop back in, I bestow the lauded Coolguy Jones of the Game Awry Review Scale onto Towerfall Dark World.